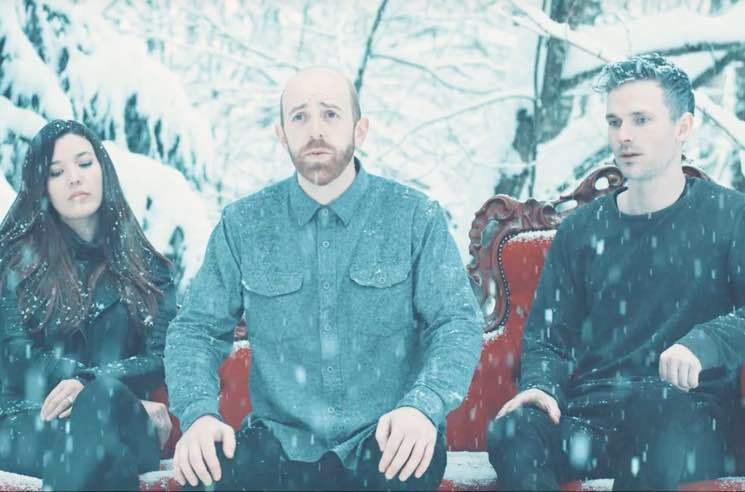 Late last year, Said the Whale announced plans for a new album titled As Long as Your Eyes Are Wide, and now the Vancouver-based indie outfit have shared the first taste of new material with a video for lead single "Step into the Darkness." The clip was shot in BC with director Sam Findlay, after an unexpected snowstorm caused the band to miss a flight to Edmonton for a show. "So we decided to make use of our predicament," frontman Tyler Bancroft tells Exclaim! "We called up our friend Sam and shot this video all day and night in the forest behind his aunt's house in Abbotsford, BC, while the snow continued to pile on." The end result shows the band in a serene, softly lit and snow globe-esque winter wonderland, flipping between day and night-time shots for some added contrast. As Long as Your Eyes Are Wide is due out on March 31 through Hidden Pony Records. Scroll past the band's upcoming live shows to watch the video premiere of "Step into the Darkness" below.